Durham, NC- A rainy Wednesday night set the scene for the first chapter of the 2018 Triangle Derby. Tobacco Road FC defeated cross-town rival North Carolina FC U-23 3-1 in their home opener at Durham County Memorial Stadium. From the opening kick off, the match began in TRFC's favor with Tobacco Road FC controlling the first possession and rattling off a shot before North Carolina FC U-23 got a touch of the ball. The match displayed an interesting contrast in style and tactics as Tobacco Road FC featured their recently adopted 3-5-2, countered by the NCFC U23's 4-3-3. 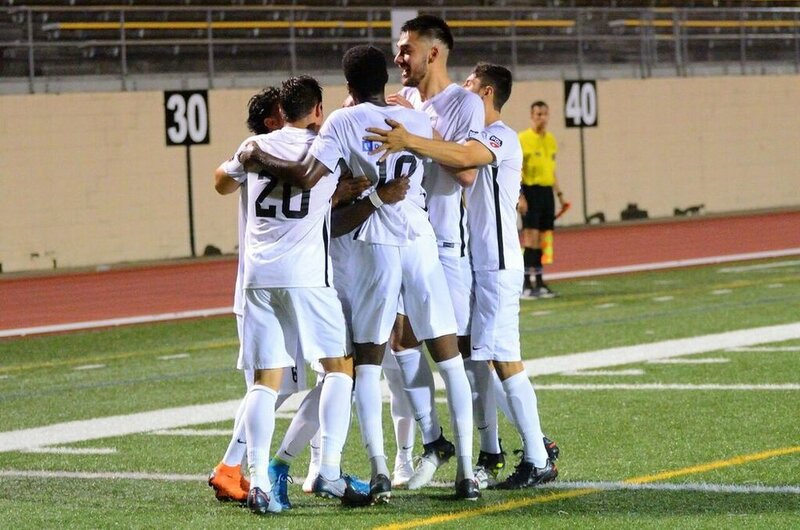 The Cary based U23 club continued trying to work through the middle of the field while TRFC attacked the flanks through the speed of forwards Eli Garner and Mustapha "Taff" Wadda. In the 29th minute Tobacco Road’s Garner broke the stalemate. Garner beat the defender on a ball played through and had a one-on-one with the keeper. Garner put it on his right food and hit a rocket into the top of the net from about eight yards out. “I came out ready to pressure the other team and make something happen,” said Garner. “I am just happy that it actually turned out the way I wanted it to." Mauricio Pineda and Javier Alcarria anchorred the center of the TRFC midfield, making things difficult for NCFC U23t overcome. Being Pineda’s first match for Tobacco Road, the chemistry between him and Alcarria is still building and should be fun to watch this season. North Carolina FC U-23 had plenty of chances in the first half, registering five shots and two corners. The Tobacco Road center-back trio and goalkeeper Ryan Cretens thwarted NCFC U-23’s attack. Center-back Delasi Batse made his first career start for Tobacco Road and received high praise from head coach Cedric Burke. The second-half featured most of the action. Tobacco Road kept knocking and had a chance in the 58th minute when Mustapha Wadda was fouled while breaking through on goal. The 24-yd free-kick just missed over the bar. In the 63rd minute Tobacco Road received another free-kick from about 35-yds out. Champe Mendoza lined up over the ball and hit a beautiful curling shot with his right foot to bend it in to the back post. The visiting team answered quickly, scoring on a cross into the box resulting a free header on goal in the 69th minute. Tobacco Road’s lead was cut in half, and the tension was palpable. Six minutes later midfielder Dylan Chain whipped a ball into the box, across the six-yard-box that bounced around and ended up at the back post for Wadda to put it in. Wadda leads the team in scoring with three goals in two games. North Carolina FC U-23 pushed hard in the remaining 15 minutes but Cretens did well to come off his line and prevent any other scoring opportunities. In the 87th minute, NCFC U23's Clayton Sparks had a one-on-one and tried to go to the left of the box but Cretens came out fearlessly, dove at the ball at Sparks feet and punched it away. Cretens finished the night with seven saves, five in the second half. This match had all the features of a derby match. Tough, physical play was present at all positions on the field and in every battle for possession. The referee had his work cut out for him, giving four yellow cards, two to each team, and a red card to a NCFC U23 midfielder. Next up for Tobacco Road are the defending national champions the Charlotte Eagles next Wednesday, May 23, at 7 p.m. The match will be played at Durham County Memorial Stadium.